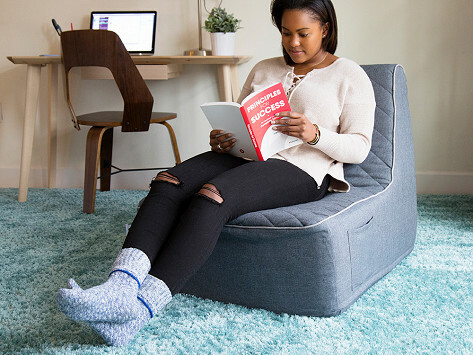 PopLounge is a comfy, expandable foam chair with a clean silhouette that looks great in a game room, dorm room, or any other casual setting. Made with shredded foam, the chair begins to expand once you open the vacuum sealed packaging, taking shape before your eyes. 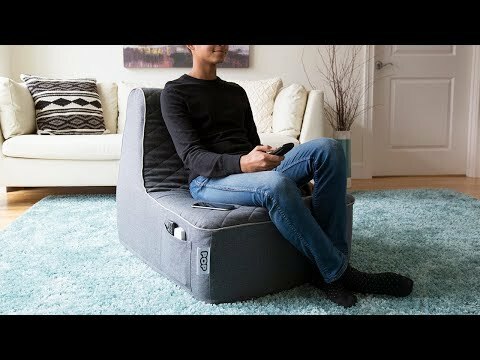 Within 48 hours, you’ll have a full-sized chair with water-resistant fabric (great for spilled drinks) and a convenient pocket for your remote or game controls. Dimensions: 29.5" x 29.5" x 25.62"
Love this chair, will be getting another later, very comfortable, very sturdy, a great all around product. Love grommet. Designed in Australia, PopLounge has made casual seating more practical and attractive. Kids, gamers, and binge-watchers will all appreciate the way it takes shape—and holds it.